Romet RM Series Rotary Gas Meters are positive displacement type meters that use the classic “roots” principle of measurement. They are suitable for Custody Transfer, Fiscal Measurement or Sub-metering. 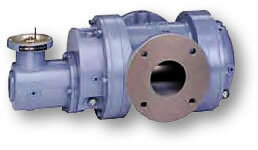 They conform to ANSI B109.3 Specifications and are approved by UL and CSA. Two counter-rotating impellers spin inside the pressurized, precision-machined measuring chamber. The rotation is transmitted via a magnetic couple to the mechanical index. An odometer style index totalizes the raw “uncorrected” volume. The uncorrected volume can be transmitted via an integrated Low Frequency Pulser to a remote mounted Index, PLC, or Energy Management System. Instrument Driver versions can be equipped with a PTZ corrector such as the Gas Micro – which compensates for fluctuations in pressure and temperature. Because rotary meters are positive displacement, the measurement is unaffected by velocity profiles or piping configuration. This permits rotary meters to be installed in limited spaces where there are insufficient straight pipe lengths required for other technologies such as turbines or orifice plates. Rotaries are accurate at very low flows and have extremely wide rangeability, permitting a single meter to be used over a wider range of applications than competing technologies. They can be installed in horizontal or vertical lines. 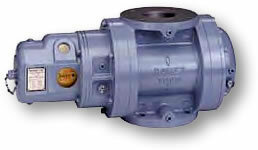 Because they are positive displacement, they will fail closed. Thus, for critical processes, a strainer should be installed and a by-pass should be considered to facilitate periodic maintenance (such as oil change every 5-7 years). In its most basic form, the rotary meter is called a Counter (CTR). It simply counts the volume of gas that is displaced through the measuring chamber and registers it on an index. The index would thus read the number of Actual Cubic Feet (ACF) at the prevailing pressure and temperature conditions. While the meter is extremely repeatable and precise, the volumetric reading is usually only the first step in attaining accurate gas measurement. Most people are not concerned with the number of Actual Cubic Feet (ACF), but rather want to know the number of Standard Cubic Feet (SCF). Because Natural Gas is a compressible fluid, it changes volume with fluctuations in Pressure & Temperature. A common convention is to define a Standard Cubic Foot as the volume of 0.6 specific gravity Natural Gas at a Base Temperature of 60 ° F and Base Pressure of 14.73 PSIA with a heating value of roughly 1000 BTU/SCF. A good analogy for understanding the effects of pressure and temperature on volume would be to look at a balloon filled with natural gas at Base conditions. The number of combustible gas molecules is fixed inside the balloon: outside in a cold environment, it will contract, inside in a hot environment and it will expand. While the Actual volume of the balloon changed, the Standard Volume and quantity of combustible gas never changed. Pressure has a related, albeit inverse, effect in that increased pressure can compress gas. As a rule of thumb we say that for every 5° F that the flowing gas temperature deviates from the base temperature of 60° F, one induces a 1% inaccuracy. For Every 15 PSIG in pressure above the base pressure of 14.73 PSIA, you effectively double the number of Standard Cubic Feet in an Actual Cubic Foot. CTR Counter versions are the most basic of the meters. 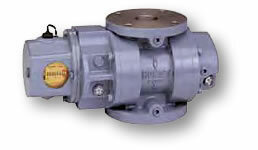 They have a single totalizer that is uncorrected for both pressure (P) and temperature (T). They are often used on low pressure, inside lines where P&T will have little effect on the measurement. TC Temperature Compensated versions, use an internal mechanical bimetal element inside the index and meter body to correct for T fluctuations in the gas. They have 2 totalizers: one Uncorrected and One TC Corrected. They are often used on low (or fixed P) where T fluctuates regularly such as outside in cold climates or if installed inside at ceiling level in a boiler room. ID Instrument Drive versions permit a pulser or PT correcting instrument to be driven by a mechanical drive dog protruding from the index (they have no totalizer). The corrector usually has an index in its base. The corrector uses a PT 100 Probe that is inserted into a thermowell. 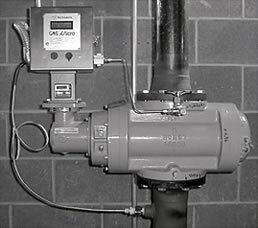 A pressure transducer in the instrument hooks up using a valving kit to a pressure tap on the outside of the meter. These meters are usually used in conjunction with a Corrector on lines where both P&T fluctuate substantially. DCID Instrument Drives with Digital Counters are ID meters with an odometer counter built into the head to provide local indication and permit a modular pulser or correcting instrument to be bolted onto the device. They are used in the same applications as ID meters – but the extra index provides some more modularity and redundancy. Pete's Plugs for Live Oil Filling/Changing.